What an event, we were fully booked out with 106 people attending the event. 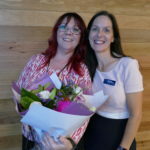 We heard from Dr Rachel King – Community Development Officer from the Domestic Violence Action Centre in Ipswich, Rachel spoke about the services they offer to those in need and where the funds we raised from all our generous guests will be spent and how it will help continue the amazing work they do. We then heard from Amanda Vickery from Riverview Community Centre – Into the View Workwear on how the donations of pre-loved clothing helps those looking to get back into the work force look and feel great when they go for interviews. Amanda also told us that they are looking for mentors to help people write resume’s, teach then interview techniques and generally help them understand the need of businesses now and what they look for when employing staff. Cathy Uechtritz, our guest speaker spoke about her journey from farmer to where she is now, the hard times, 24% interest rate and no rain to feed their land, the deaths of animals during floods and how her children were involved in everything her and her husband did. The never give up attitude Cathy has, that I’m sure she passed onto her children, really shows anything is possible if you work hard and are passionate about what you do. All our guests dug deep and we sold 500 raffle tickets, the pre-loved workwear overflowed the donation box. Thank you to everyone who attended and all the donations of clothing and purchasing raffle tickets, the committee are blown away by the generosity of our guests. Thank you to all the kind raffle prizes donated by our members, we are extremely grateful for all your support. We will announce the final figures once all has been processed.